It’s PowerCLI release day and this is a significant one! This new release of PowerCLI is versioned at 6.5.1 rather than what you probably expected which would be 6.5 R2 (following on from our last release). We have made this change in order to fall in line with the best practices for being used in the PowerShell Gallery! First and foremost, the largest update to this version of PowerCLI is regarding how the installation process has changed. As of this release, you no longer have an MSI file to download and install. You can now install PowerCLI directly from the PowerShell Gallery! This update streamlines the install process in multiple ways and allows module based features which PowerShell users will be used to from other PowerShell based additions. For a detailed walkthrough on this new installation process, please see this blog post on Installing PowerCLI from the PowerShell Gallery. The modules have also been updated to support the PowerShell auto-loading process. This allows PowerShell to automatically import the necessary modules in order to process the desired entered cmdlet. A good example would be to open a new PowerShell session, enter “Connect-VIServer” and then populate the parameters as you normally would. You’ll be pleasantly surprised to see the cmdlet working properly without any other input for cmdlets required. One other major change has happened to the main vSphere module (vim.automation.core module) concerning the Site Recovery Manager (SRM) cmdlets. The SRM cmdlets have been removed from the Core module and a new SRM module has been created. The new module is named VMware.VimAutomation.Srm and features updated cmdlets that enable users to interact with the API views for the SRM 6.5 API! Speaking of APIs, there are a couple other modules which have been updated to work with the most current APIs. The vR Ops module has been updated to work with the views for the vR Ops 6.5 API. The Horizon module has also been updated to work with the views for the Horizon View 7.1 API. The Storage module has also been updated to work with the views for the latest vSAN 6.6 API. As evidenced above, PowerCLI 6.5.1 is a pretty big release. PowerCLI being available exclusively through the PowerShell Gallery allows for a streamlined process of installing PowerCLI. There have been new cmdlets added to handle the management of DRS clusters. Several modules have been updated to interact with views for the newest APIs on SRM, vR Ops, Horizon View, and vSAN. The storage module has had quite a few improvements made around the vSAN iSCSI capabilities as well as SPBM. For more information on changes made in VMware PowerCLI 6.5.1, including improvements, security enhancements, and deprecated features, see the VMware PowerCLI Change Log. For more information on specific product features, see the VMware PowerCLI 6.5.1 User’s Guide. For more information on specific cmdlets, see the VMware PowerCLI 6.5.1 Cmdlet Reference. Spotlight on the New DRS Groups and VM-Host Rule Cmdlets! This entry was posted in General and tagged PowerCLI, What's New on April 20, 2017 by Kyle Ruddy. Is there going to be a standalone PowerCLI 6.5.1 installer released as well for those of us who’s corporate firewall blocks direct installs from the PowerShell Gallery? I’m really looking forward to working with it, but without that, I won’t be able to. Currently we plan on blogging about offline installation instead as there’re various ways of handling it (for these types of use cases), all of them possible today and in the context of the gallery. The Powershell Gallery looks regarding quick “Home” Installations… but for Enterprise Users / Intallations an MSI is far better. Well, that really depends on the use case. Each of these two approaches has its advantages imho. InstallShield is notoriously slow, quite buggy and often leaves undesired traces – on both the file system and the win registry. It’s also an OS-specific technology which makes it a worse longer-term choice as a unified distribution vehicle. Package managers on the other hand introduce nice things like addressing the unified distribution, provide finer granularity (which is good if you only use let’s say 2 out of 10 modules), means for continuous delivery, etc, but.. certainly do raise the bar wrt managing your dependency graph. Quite a few big corporations are using internally hosted package managers these days (e.g. maven and the like), so the concept is certainly not new, nor unproven to work. When you have a Installation Package you can rollout Software predefined and preconfigured. If you need standardized Client or Server Installation then you already use these methods. The second thing is that Internetaccess with an User which can install Software is not intended. This is great if you are a home user or a work from home “vExpert” blogger. This is less than optimal for some of your real Enterprise customers that are behind proxy servers, corporate firewalls, or those of us who don’t have control over what updates are installed on our workstations. My workstation is running Windows 7 with PowerShell 3.0 and WMF 3.0. WMF 5.1 cannot be installed on Windows 7/2008 R2 when WMF 3.0 is installed (https://msdn.microsoft.com/en-us/powershell/wmf/5.1/install-configure). The alternative of installing the standalone PackageManagement PowerShell Modules Preview for PowerShell 3.0 is not working (see error below). My only other alternative would be to run Windows 10. Unfortunately, my company does not allow upgrading to Windows 10 yet. I’m sure this is not an uncommon situation for a large number of enterprise customers. PackageManagement\Find-Package : No match was found for the specified search criteria and module name ‘VMware.PowerCLI’. I would be curious to know what version of PowerShell and .NET you have currently installed. You can also install this ps module (http://pscx.codeplex.com/), import pscx and then ‘dir gac:’ to check whether you don’t have some gac left-overs from several releases back. Not providing the offline bundle seems odd. I can’t install through an online repository due to SSL intercepts. This release seems rather poor for enterprise considerations. Another corporate firewall victim here. Had to go to a coffee shop to deploy a datacenter automation tool. The coffee was good though. I used the MSI Installer version. Pingback: Latest PowerCLI release now supports VVol replication test failover » Welcome to vSphere-land! It would sure be nive to have a MSI package as well. I realize this is a newer, more modern and flexible way of installting – but its making it quite a bit harder for me to use, due to VERY strict security regulations. Of course, I cound just stay on the previous release – but I don’t really want to. Both metods of install would be appriciated! Yes please, let us know when the .MSI file released ? Albert, are you having issues with the Gallery install? We’re phasing out the MSI install to fall in line with Microsoft’s standard module install methods. I just had this error message that appears when you try to attach a baseline to a non-existing entity is improper. Thanks Phoenix, can you contact support and give them the details of the error? Another “Enterprise policy victim” here. My inet-user isn’t allowed to install software, my admin-user isn’t allowed to access the internet. MSI-installer (or at least a zip file for download) would be greatly appreciated. Still no offline bundle? Looks like we will be phasing out PowerCLI going forward. Guess that’s in line with cloud first. VMware has worked very hard to lose customers as of late. Chris: Would you mind dropping me an email – kruddy at vmware dot com? I’d love to find out some more information about what issues you’re having with this new release. As it relates to the new PowerShell Core 6.0, PowerCLI will not load. It works fine in the WMF version of PS, but this is the new direction MS is taking the product in – open source and cross-platform. I even tried reinstalling PowerCLI to no avail. Copyright (C) Microsoft Corporation. All rights reserved. Import-Module : The type initializer for ‘VMware.VimAutomation.Sdk.Interop.V1.CoreServiceFactory’ threw an exception. Correct. This release is still very much a Windows-only release. Thanks for the info Kyle. I’ll wait for new updates before I start testing scripts to ensure they work across the board. I really like the new PowerCLI version – it makes reporting on and managing the environment so easy. Connect-VIServer : The type initializer for ‘VMware.VimAutomation.Sdk.Interop.V1.CoreServiceFactory’ threw an exception. Come on… really? why even have this stuff released if it doesn’t work in cross-platform. I build apps (usually in Go) and it works on ALL target platform out-of-the-box. This is frustrating! I guess I’ll have to go back to Python SDK. Till 6.5.0 Power CLI, VMware.Vim.dll was strong name enabled dlls. But from 6.5.1, those dll’s are not strongly named dll’s. In PowerShell gallery based installation also, dll’s were not strongly named. Unable to load those dll’s into strongly named execution binary. then you have to apply such strategies to your won blog. This blog provides insight and highlights for VMware PowerCLI, the best tool for automating management and configuration of VMware Products. These products were all smart enough to use PowerCLI, so they must be pretty good. 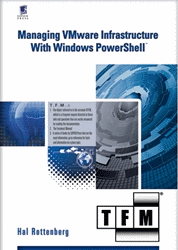 Discussions and resources for Windows powershell interface for managing vSphere.